Tom Jenkins served as a Judge on the San Mateo County Superior Court from 1976 to 1990, and he served as the Presiding Judge in 1980. As an attorney, he was in private practice as a partner with Hanson, Bridgett, Marcus & Jenkins in San Francisco from 1956 to 1975. Many honors and held many memberships. We recognize Judge Jenkins for his vision and leadership 46 years ago as a founder of both the California Association of Homes and Services for the Aging (now Aging Services of California) and the American Association of Homes and Services for the Aging. Both organizations were founded in 1961, as was RHF. 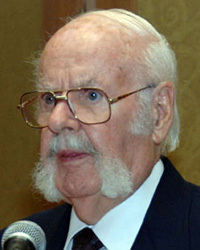 Judge Jenkins was President of the American Association of Homes and Services for the Aging in 1966 and 1967 and a member of the Board of Directors from 1962 to 1968. The impetus of founding both CAHSA and AAHSA was the recognition of future national demographics and the need to address aging services in our nation and state and also to address the issue of tax exemption. For nearly five decades, Judge Jenkins has been a voice of wisdom in these two organizations, and he attends most annual meetings of both ASC and AAHSA. He is married to Anne, and they have three children. For Judge Jenkins’ vision and accomplishments in the past and for his continued wisdom, Retirement Housing Foundation is pleased to present him with our 2007 Friend of the Elderly award.